I'm in the process of looking for a new book community (need I say more?) so hopefully booklikes is it. For now I'm just figuring out the site. For a first novel this was a really good book. 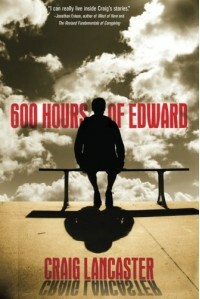 There is a lot of repetition thoughout but eventually it becomes so much a part of the unique character of Edward that we get to know and love that it just begins to flow along with the story. The first few pages are the toughest to get through, the repetition at it's heaviest. It does lessen and I believe the author did this so people could really get a feel for what Edward goes through on a daily basis. I found the first half of the book quite humorous and second half more serious. What I didn't like was how rushed the second part of the book seemed. I believe this was written for some sort of contest so this may be why. As humorous as Edward's life appears to be he is still dealing with Aspergers as well as some pretty heavy emotional baggage regarding family. These, especially the family issues were wrapped up pretty quickly. I'm not to familiar with Aspergers but I am with mental illness in general and I know it can be quite a roller coaster to getting well again. I don't think the author showed how serious and devastating setbacks can be. Again to rushed. Still a very worthwhile read and I will probably pick up the second.book at some point. Hopefully it wasn't written in a time crunch.